Who Pays When Dining out for a Business Meeting? Many business professionals hold meetings during lunch or dinner time with staff, clients, investors, or other business professionals. What if your meeting seems to be hindered by bad restaurant service? Should you complain? The answer is yes, always, but with diplomacy. 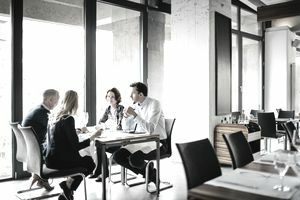 Proper restaurant social skills in a business setting are a little different from when you are out dining with your family. For example, it is okay to ask for a discount on bad service when you are with your family, but not when you are with a business associate. If you are meeting someone at a restaurant, you should arrive at least ten minutes early. Be sure to greet them with a friendly business handshake and address the person by their name and make direct eye contact if you are doing business in the United States. Other countries have different social conduct rules, so if you are traveling outside of the U.S., it pays to take the time to read up on social customs and etiquette for the country you will be visiting. Never order for your business associate. If they ask for help ordering or seem uncomfortably indecisive, you can recommend something you may have previously tried or ask the waiter to help with a suggestion. When the waiter arrives at the table, defer to your associates and let them order first. If it is necessary to complain about the meal or service, remember that how you complain could make or break your business deal. Making a scene in public over cold spaghetti might get you a free meal next time, but it is not going to seal your business deal. Instead of viewing bad service at a restaurant as a problem, seize it as an opportunity to impress your business associate with your ability to remain calm, take charge, and handle a situation with finesse. Do not let lousy service reflect poorly on you but ignoring the problem. Who Pays the Bill for a Business Lunch or Dinner? If you invite someone to lunch or dinner to discuss business, you should always expect to pay. If an associate invites you to discuss possibly giving you their business or investing in yours, you should at least offer to pay the bill. If the associates say they will pay, you should offer to at least pay your half and leave it at that. Never fight over a bill if someone else offers to pay; you can counter once, and then after that thank the person paying for the generosity and offer to pick up the tab the next time. Always bring a credit card to pay for the meal, or, if you are paying in cash, bring twice the amount of money that you expect the lunch to cost. Treat restaurants as an extension of your office and the restaurant staff with the same respect and courtesy you would give to your employees. In a business setting, tipping is not optional. Consider tipping mandatory when it comes to entertaining business expenses. Even if service is substandard, still leave at least some tip. When entertaining a business client, it is essential to tip an amount appropriate to the level and type of service. Tipping too much without merit is an insincere gesture that is not likely to impress your client. Over-tipping is an emotional decision vs. a business transaction. In a private setting that is fine; in a business setting, all your meal transactions should reflect the business. Tip jars are nothing more than counter-top pandering. The haul is usually divided among co-workers who do not rely on tips for income and is even shared with employees who did not provide you with any direct counter service. You should not feel obligated to chunk your change into a tip jar but if you are with a client and want to add to a tip jar for the sake of appearances, add a dollar bill, not your spare change.